These are just stunning. The black and white works well but my favorite is the large color version. You were lucky to see so many. Mary MacADNski: It has been amazing to see these. They are still here too but not so numerous. All good, and the montage is even better! Mary MacADNski: I have several montages of various plant types. Mary MacADNski: Thanks, Frank. It is still going on. Really, beautiful images, all, Mary! Mary MacADNski: They are still here but not as numerous. What a great sight! Mary MacADNski: Not something we often see. Mary MacADNski: It has been and still is an amazing phenomenon for us to have this many. How can you not fall in love with such Painted Ladies, Mary! Mary MacADNski: They have me enthralled. I think the two formats are both good here Mary. Mary MacADNski: I actually like the black and white very much and one especially one to come. I think the b&w butterfly is something to get used to, but not unacceptable. 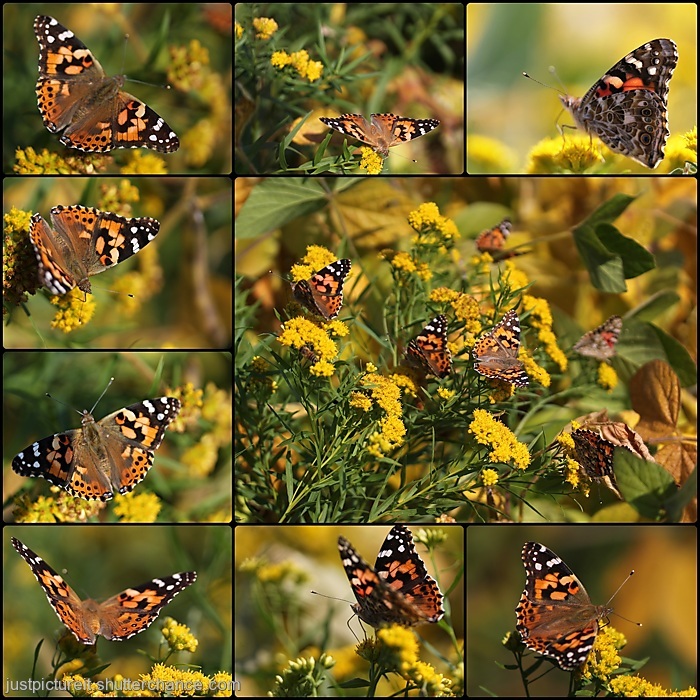 The collage of painted ladies is a great collection. Mary MacADNski: I like black and white butterflies as the 'come-on' signal is being interrupted and I am so curious. What a great collection of images, as I said the other day even one of these in our garden this year would have been a bonus. Mary MacADNski: It has been so delightful to see these like never before. Climate change is shaking things up. Mary MacADNski: They are still here! Oooeerr.. they are beautiful. I like your inclusion of the collage. Mary MacADNski: It has been a gift seeing this. These are spectacular. The B&W is great. The coloured pictures are a delight, so many butterflies make me happy... such wonderful creatures. Mary MacADNski: I have been amazed at the diets of them. The goldenrod is it's favorite here but it loves other flowers too. What a lovely collection of images Mary. Mary MacADNski: i have them on other flowers as well. Oh, you are a master in nature photography! 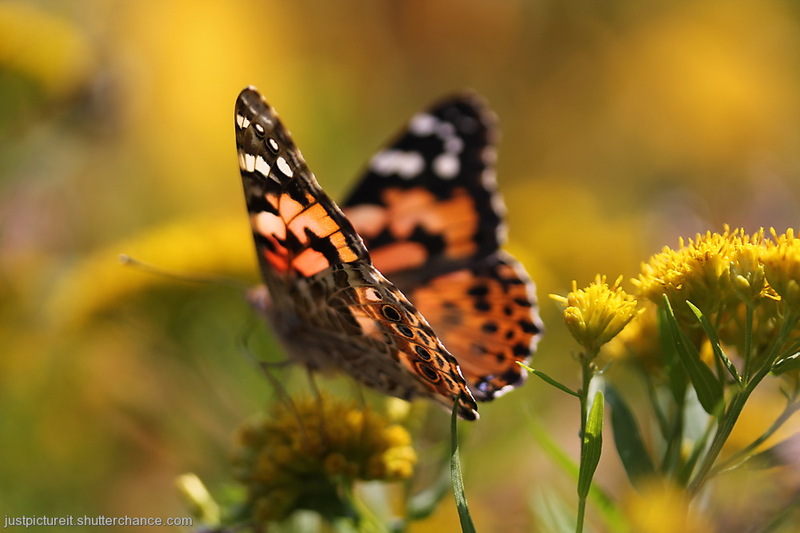 Mary MacADNski: The star here is the Painted Lady Butterfly on an unusual super-bloom of them across North America. Mary MacADNski: I like the BW a lot to tell the truth. the first two images are great Mary... then you bring us a collage that is out of this world... i have never seen a gathering of butterflies like the shot in the center... Bravo! Mary MacADNski: They are still here but not in the same numbers. What a great experience. I'm intrigued by the b/w of a butterfly!! Great idea.All these images are so beautiful and you proved that color isn't everything. The shallow DOF on the big colored one is quite effective! Good Job! Thanks for the smiles it brought. Mary MacADNski: I appreciate that you like it. I find the black and white intriguing.